Hi loves! You as happy with the weekend as I am? With the Dutch holidays lately there hasn't been a full workweek for a while now, so it was kinda tiring to have to work 5 days straight again ;-). I have a gorgeous manicure for you today (at least that's what I feel about it) and it is also my first attempt at this technique! I am talking about stamping with two colors, trying to create a gradient look. That last part didn't really work out for me yet but I still love the 2 colors together, so it's not a failed manicure for me. I started with a base of Revlon Night Plum. What a disastrous formula. Thin, sheer, runny... I did NOT like it. It also dries very dark, darker than the bottle shows so I ended up with a near black purple color. I needed 3 coats and I don't think that's acceptable for such a dark color. After it dried (luckily quickly because of the thin formula) I grabbed Bundle Monster 223 and China Glaze Joy and Hi-Tek to do the stamping. To create this look you paint a small strip of your first color, and just below that you continue with your second color. Swipe, swipe again in the same direction (makes it blend a bit more) and stamp as usual! I really love how stamping designs using polishe slike these come to life after applying topcoat <3. The sparkle and shimmer just sizzles! 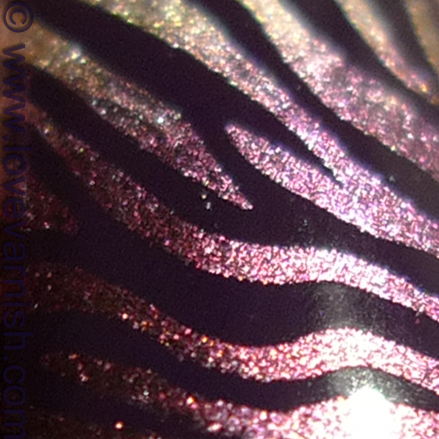 Tell me, do you like this two toned stamping? Have you ever tried the technique? That's super pretty! Fantastic job! This looks beautiful! I honestly thought this was a gradient with a stamp OVER it, not the other way around! This is so gorgeous !!! You did an awesome job!! Super mooi! Geweldige kleurencombi! Ik wil dit ook eens proberen. I think I never got a "brilliant" before :D! Glad you love it too Elin! Thanks a lot Eva, you can be sure I'll be trying this more often in the future. Thanks Angie! Seems you are not the only one :D.
You should! So much fun! Dank je wel Deb! Zeker doen, het is de moeite waard (en het is weinig extra moeite t.o.v. gewoon stempelen). LOVE!!!! I agree on a dark polish taking more than 2 coats is ridiculous! But the rest of this is amazing! Pity for Revlon :/ BTW the final result is gorgeous! :D yeah it seems everyone thought so! And thanks <3.